Second Department Grants Leave to Appeal to Court of Appeals Sua Sponte. Can It Do That? People v Flores is an important case. In Flores, four criminal defendants were tried together on gang assault charges. The County Court where they were being tried, however, decided that it was going to empanel an anonymous jury, with the jurors identified only by number, not by name. The defendants’ objected, arguing multiple times that they were entitled to know the names of the jurors and that they were being deprived of a fair trial, but the County Court denied their objections. Each was convicted of the charges and was sentenced to prison. On appeal from the convictions, the Appellate Division, Second Department held that the New York Criminal Procedure Law does not permit the empaneling of an anonymous jury, and because it deprived the defendants of a fair trial, harmless error analysis doesn’t apply. The Court, therefore, reversed the convictions, and ordered a new trial. Even the dissenter agreed that the CPL doesn’t allow a court to withhold the names of the jurors from a criminal defendant, but would have found the error harmless and affirmed the convictions. I’ll start with what the Court says it is doing. The Court’s order purports to grant leave to appeal pursuant to CPLR 5602(a)(1)(i), which provides for permission to appeal a final order of the Appellate Division that isn’t appealable as of right. Leaving aside whether the Second Department’s order in Flores is appealable as of right for purposes of this post (an argument likely could be made that the case directly involves a substantial constitutional question), the Appellate Division’s citation to CPLR 5602(a)(1)(i) is just wrong. The Appellate Division’s order is not final. It reversed a final judgment of conviction, and ordered a new trial, so there are further proceedings still pending in the case. Because the Appellate Division’s order is nonfinal, CPLR 5602(a)(1)(i) doesn’t apply. 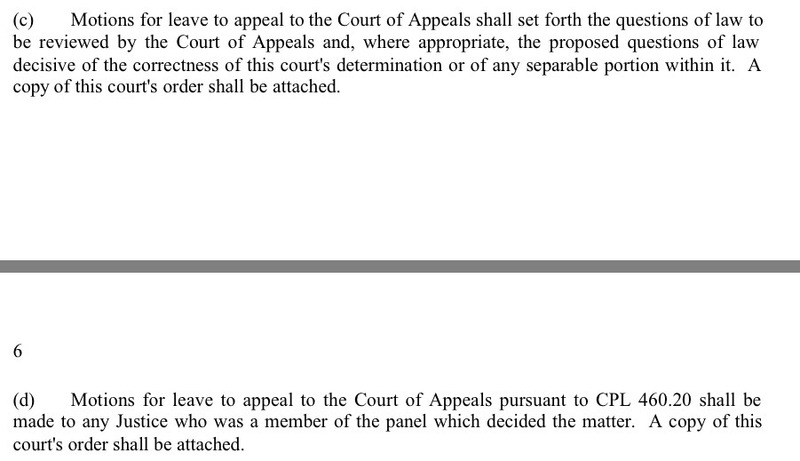 Next there’s CPLR 5602(b)(1), which just generally provides that the Appellate Division may grant leave to appeal from a nonfinal order, like this one, except in a few instances that don’t apply here. Ok, so that fits, but what about granting leave sua sponte? The Second Department’s rules govern motions for leave to appeal to the Court by parties, but don’t seem to contain any rules that would limit the Court’s inherent authority to grant a motion that it makes on its own. The Appellate Division does regularly grant leave to appeal to itself sua sponte where parties have taken an appeal as of right to the Appellate Division where the trial court order is only appealable by permission (see e.g. Ray v Chen, 148 AD3d 568 [1st Dept 2017] [“we sua sponte deem the notice of appeal from that [nonfinal] portion of the order to be a motion for leave to appeal, and grant such leave”]). That seems to fit, but still in those cases the party did something to show it wanted to appeal. It just did the wrong thing (file a notice of appeal) and the Court was correcting the party’s error on its own motion. It wasn’t giving the party an appeal the party never asked for. Finally, we note that the Appellate Division affirmed Supreme Court’s order, without opinion, and sua sponte granted leave to appeal to this court. The Appellate Division’s certification in the absence of any request by the parties bespeaks its conclusion, after having read the briefs, heard the parties and fully considered the appeal, that issues of law of particular significance were presented that merited the attention of this court, as well as the commitment of further time and expense by the litigants. While this court, and the entire appellate function, are better served when the regular review process is followed, including some articulation of the reasoning the intermediate appellate court chose to adopt when it considered the case and reached its result (see, Rufino v. United States, 69 N.Y.2d 310, 514 N.Y.S.2d 200, 506 N.E.2d 910), such an articulation is all the more important in those few cases singled out by the Appellate Division for sua sponte certification (id. at 1014). So, it’s clear that the Appellate Division would have authority to grant leave to appeal on its own motion in a civil case, but what about in a criminal one like this? 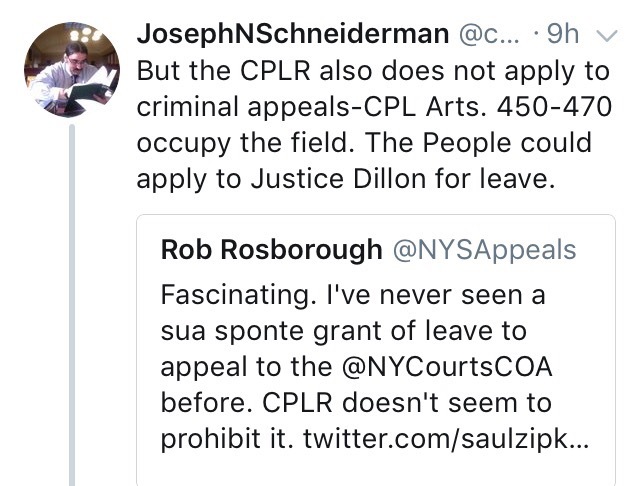 As Connecticut and Massachusetts criminal appellate lawyer Joe Schneiderman (@connlawjoe on Twitter) reminded me, the civil lawyer, the CPLR generally doesn’t apply to criminal cases; the New York Criminal Procedure Law does. In fact, the Court of Appeals only a few months ago made that clear in Matter of 381 Search Warrants Directed to Facebook, Inc. In the Facebook case, the Court of Appeals was faced with whether the denial of a motion to quash a federal Stored Communications Act warrant was appealable, and it held that because the warrants were issued in a criminal case, the CPL governs their appealability. Here, the Second Department’s order was also issued in a criminal case, so the Court’s citation to CPLR 5602 as the basis upon which it granted leave to appeal is puzzling. Under CPL 460.20, one judge of the Appellate Division or Court of Appeals may issue a certificate granting leave to appeal to the Court of Appeals in a criminal case. “An application for such a certificate must be made” on notice to the other side (CPL 460.20[a]). According to Peter Preiser, who wrote the practice commentaries for CPL 460.20, obtaining that certificate is the only way to take an appeal to the Court of Appeals in a criminal case. Although the statutory text provides the manner in which an application for a certificate granting leave to appeal must be made, it does not seem to preclude a court from exercising its inherent authority to grant the certificate sua sponte. Although the Court of Appeals has, at times, refused to use analogous provisions of the CPLR to interpret the CPL (see e.g. People v Knobel, 94 NY2d 226, 230 ), because this case involves the inherent authority of a court to act on its own motion, I would suspect that the Court will follow its prior recognition in Babigian that a motion or certificate seeking leave to appeal may be granted sua sponte. The Second Department’s opinion can be found here. HI Rob-Whatever became of this jurisdictional issue? Did an AD Justice of a Judge of the Court grant leave? The Court took the case and is going to decide it on the sua sponte merits track without oral argument. The Court apparently wasn’t concerned about the jurisdictional issue, because there wasn’t an additional order from the Court concerning jurisdiction.